BIOPAC has special expertise in research conducted in the MRI and provides a number of solutions for human and small animal MRI applications, and provides digital triggers and gating systems for use in the MRI. Dual Channel Gating Systems (DTU200/300) send cardiac pulses to the MRI when respiration is in the quiet phase. Trigger Reference can be rising or falling edge of signal. 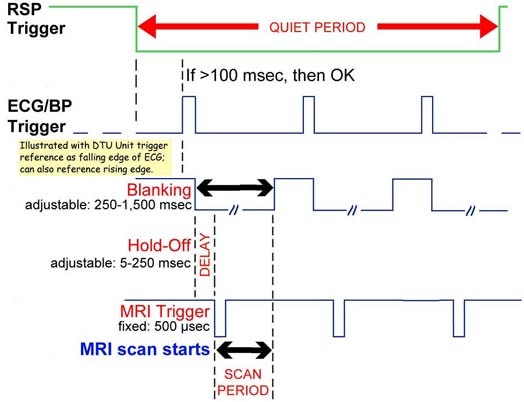 Digital Trigger (DTU100) triggers an MRI system with the occurrence of the R-wave present in animal (high frequency) ECG or respiratory data for gating purposes. Human and animal research into ECG and RSP or BP is supported. When used with BIOPAC MP data acquisition and analysis hardware platforms, AcqKnowledge software, transducers and related components, these triggering and gating systems are elements of a complete research system for use in the MRI.